This year includes minor corrections and updates. If you already have copies printed from last year, once you purchase your annual license you can continue using them. Updated Spanish language handouts. Now the Spanish language handouts have the same look and updates as our English files. New Commonwealth edition. We have added a full edition designed for the U.K., Canada, Australia, and other Commonwealth countries that use British English. Reduced ink. We received enthusiastic support about the new graphical look, but also some concern about your printing costs. We have adjusted our design in pursuit of a perfect balance between the two. Confirmation for older children. Our four sessions for confirmation in restored order are now also offered for children ages 10-14, just as Reconciliation and Eucharist. More comprehensive catechist handouts. We now cover the pages for ages 10-14 when there are significant differences and give you more insight into what is included in the parent pages. Reduced file sizes. Your downloads will be a lot quicker, now that we have reduced the files sizes. In some cases, they are now half the previous size. New page orientation for parent/catechist pages. While child pages remain in portrait orientation, the other handouts are now in landscape. This allows us to increase the size of page thumbnails and have a more natural layout. A New Look - If you've used Growing Up Catholic in the past then you will immediately notice the difference, with a fresh, more engaging look that will also make the pages easier to use. Easier to Navigate - The footers of all pages are consistent and clear, so that you know what's what even if you drop everything on the floor by mistake. They are also color-coded: green for children, blue for parents, and red for catechists so you know what a page is from a quick glance. From Papa Francis - The parent pages for every session include a box sharing a related quotation from Pope Francis, whose down-to-earth approach make people pay attention. Revised and Expanded Leader Guides - We have completely redesigned our leader guides and added even more helpful information to them. They continue to be openly available for your full review. New Supporting Documents - We have added some helpful extra documents, such as prayer slips you can print out that include the question to be answered. Final Retreats/Rehearsals - We now include our popular final retreat and rehearsal for First Eucharist (Get Ready! Get Set!) and First Reconciliation (Pardon & Peace) for free with the associated preparation sessions. Full Middle School Edition - Instead of a couple replacement pages per session, we now offer full English middle school sessions. While the sessions remain similar to the grade school ones, we have adapted all of the content so it is age-appropriate. Church Mice - You'll find our friendly church mice throughout the child lessons, playing, pondering, or just hanging around. They add a little fun in case your sessions are in danger of getting too serious. 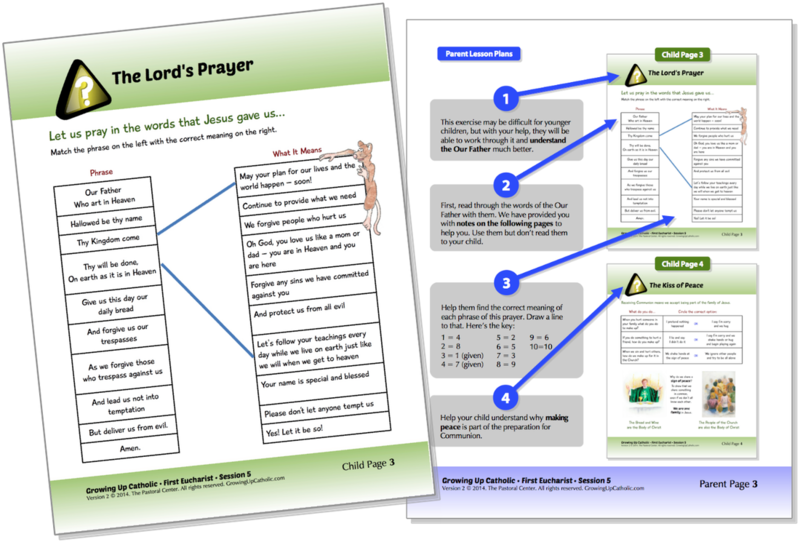 New Session Checklists/Timelines - We have changed the first two pages of each catechist session handout to make them much more helpful. They now include a short bullet-point overview of the session, a checklist, and a one-page timeline listing each page in the lesson and steps to complete. Completely New At Home Website - We believe the At Home experience is such a key to making faith formation last a lifetime that we have completely revised our website and especially pages for parents. Now each session has its own web page with videos, activities, and many resources. But we've just gotten started with it, and will continue to improve it throughout the year. What Hasn't Changed - You'll find the same engaging handouts, flexible format, focus on coaching parents, fun activities, faithful Catholic teaching, and affordable price as before!